Description: This beautiful piece is a narrower version of the Chest of Drawers #1 that was a triple award winner at the International Design in Wood Exhibit and Competition in San Diego. The clean design highlights the unique beauty of the wood. 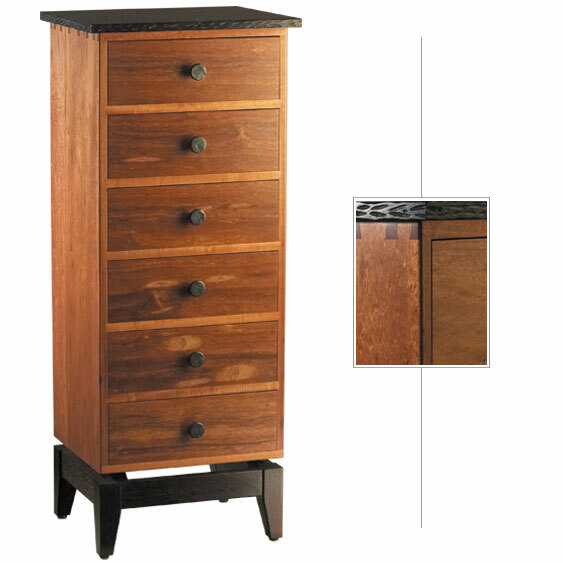 The top is crafted from solid Wenge with hand carved edges. The chest appears to be suspended from the beautiful Wenge base. The craftsmanship is exceptional with beautiful and sturdy joinery, custom fitted drawers and a satin smooth finish. This is a perfect piece for lingerie in the bedroom or a functional art piece in a hall or den.